…like studying biochemistry on a Saturday night! I know, I know, you are all jealous. But hey, you can’t have play time all the time, right? And seeing as my first midterm is coming up in a mere 2 weeks, I figured it was time to get down to business. Don’t worry, I didn’t spend all of my Saturday night with amino acids. I made the trek to the gym late in the afternoon, and the traffic had actually gotten better since this morning. Hurray for that for sure. I had a mind clearing cardio session on the stairclimber and elliptical, then made my way home. 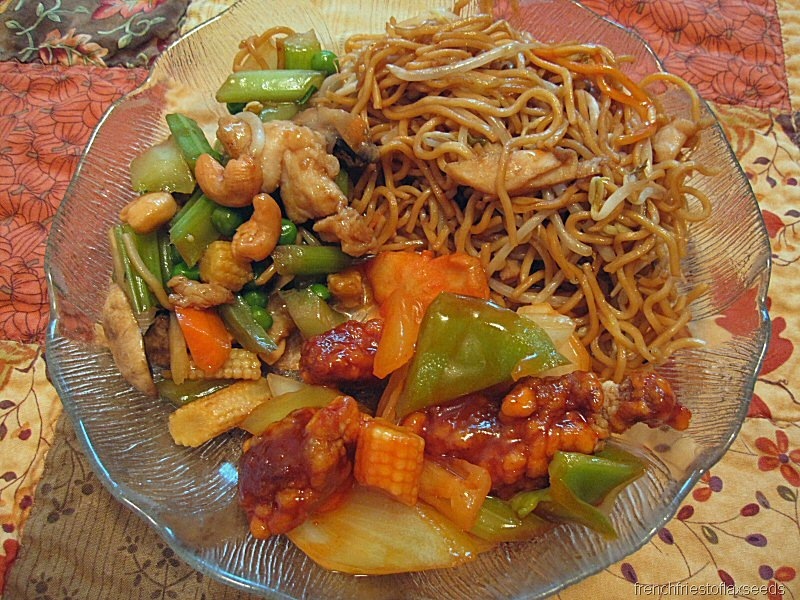 It was only myself and my dad for dinner tonight, and he had a hankerin’ for some Chinese food. What can I say, it’s one of our family go-to take out options! Since it was only the two of us, we each ordered a 3 item dinner for one, so we could customize what we wanted. Well, let me tell you, this dinner for 1? It was at least two dinners’ worth of food. So like a good little girl, I portioned out half of the food onto a plate, and put the rest away in the fridge. The list of choices for the dinners was pretty limited, but I worked with it. 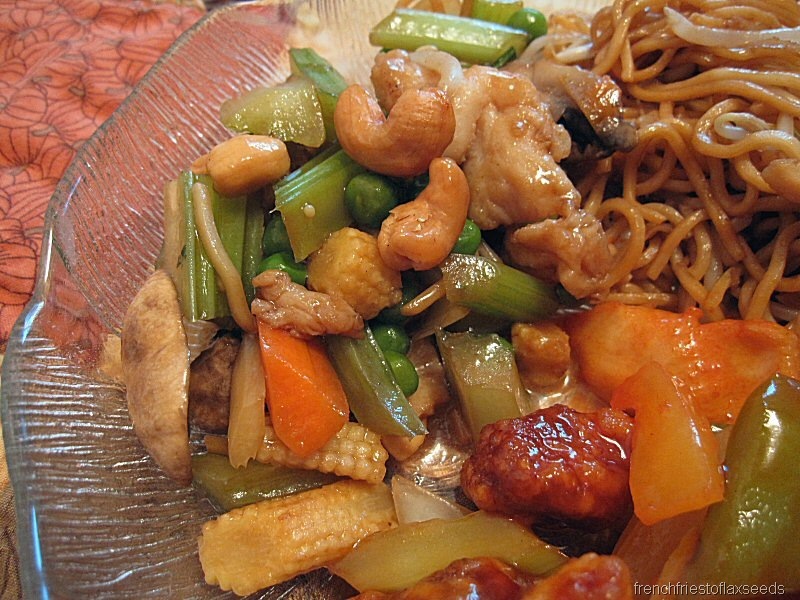 My first choice was the Diced Chicken With Cashew – chicken, celery, carrots, peas, mushrooms, baby corn, cashews. 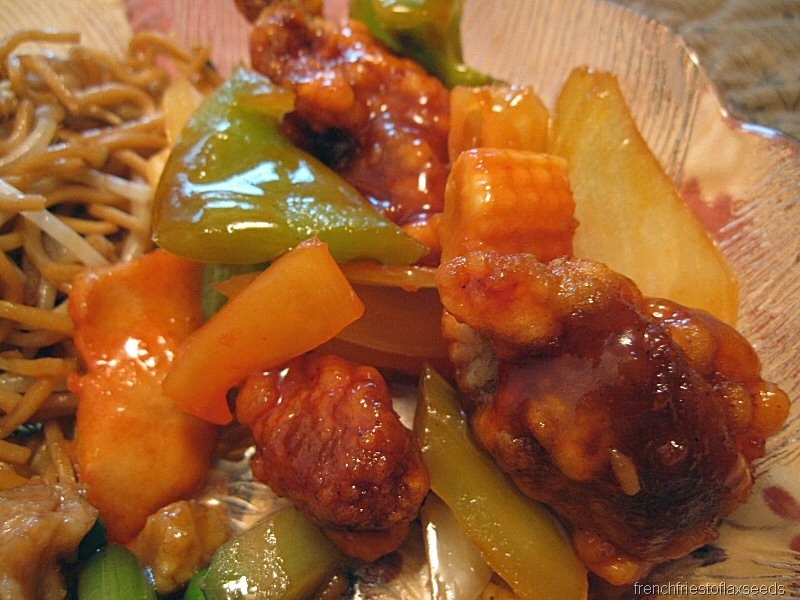 Choice #2 was the Sweet & Sour Pork – pork, green pepper, onion, pineapple. 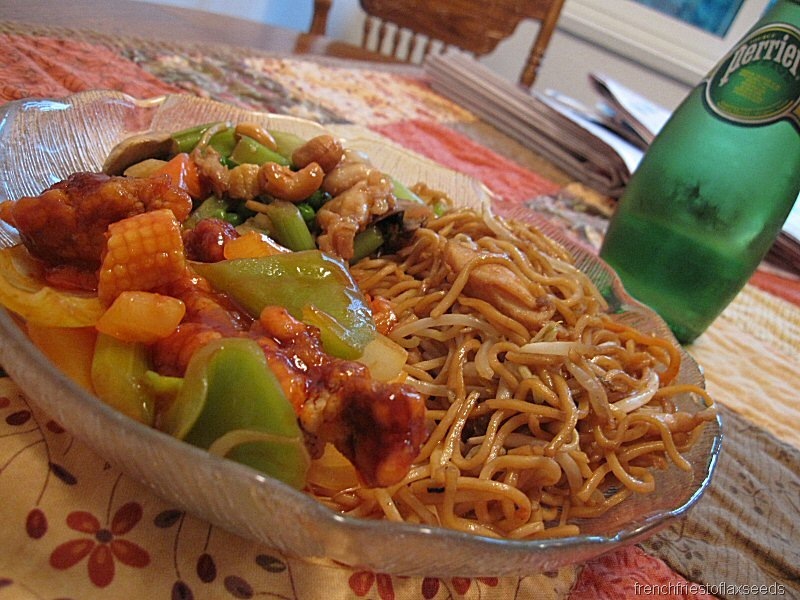 And I can’t have Chinese food without a noodle, so I went with the only option – Chicken Chow Mein. After dinner, I got caught up on a couple shows on the PVR from this past week, then watched the remainder of one of the late hockey games while getting caught up on some reading. Then I figured it was about time to dig into the biochemistry. Of course, studying required brain food. 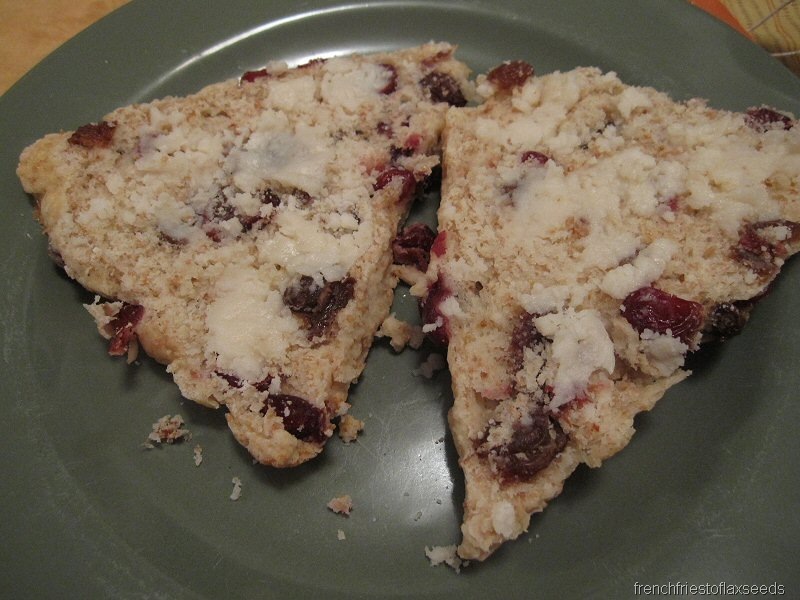 My mom’s fruit scones sounded like the perfect option. 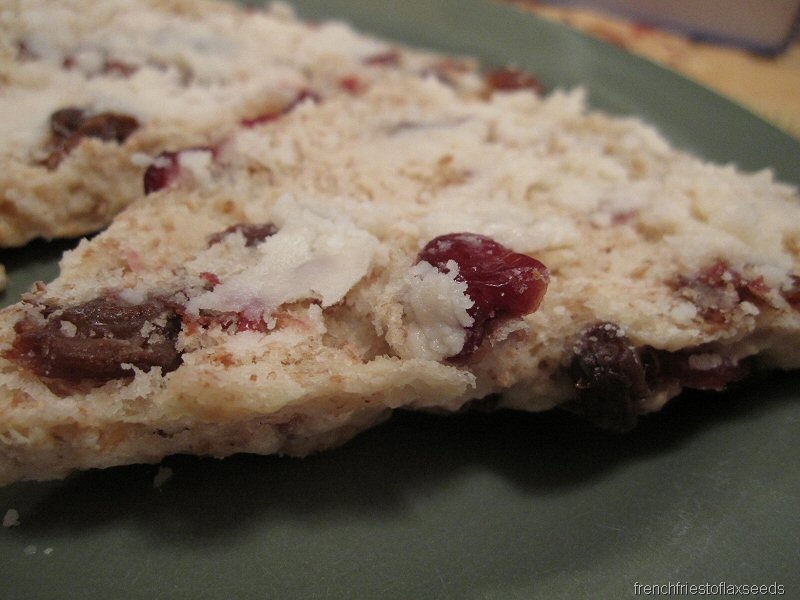 I heated mine up and spread on a wee bit of Artisana Coconut Butter. 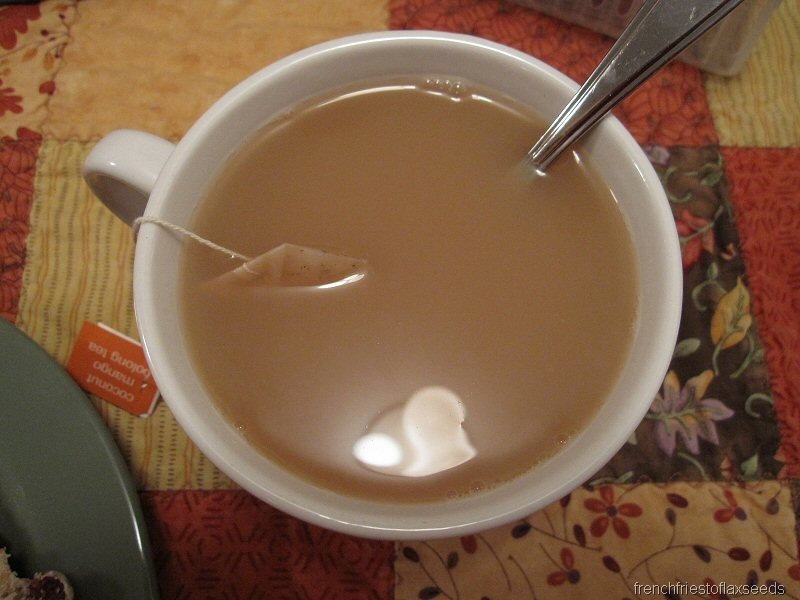 I also brewed up a cup of Stash Coconut Mango Oolong Tea, with a splash of unsweetened vanilla Almond Breeze and agave nectar. Tea & scones. How British of me! Of course, my dad brought me another distraction – he has a hockey pool through is old work, and he asked if I wanted to put in a team. Like I could say no. So once I had my fill of biochem knowledge, I started perusing my options for this hockey pool. Yes, I’m a hockey fiend. What can I say? Maybe this year will be my year, and I’ll actually turn a profit on my hockey pools? Fingers crossed people! And now, my Saturday night has turned into Sunday morning, which I think is my cue to consider some sleep. Night! Oh man, studying on a Saturday. At least you had a great dinner to make up for it! I’ll be doing some work today too, so don’t worry you aren’t alone with doing work on weekends!! I actually am kind of jealous!! I never thought I’d say this.. I actually MISS school so badly! Oooooh, amino acids. You and I are going to be the studious bloggers this weekend! 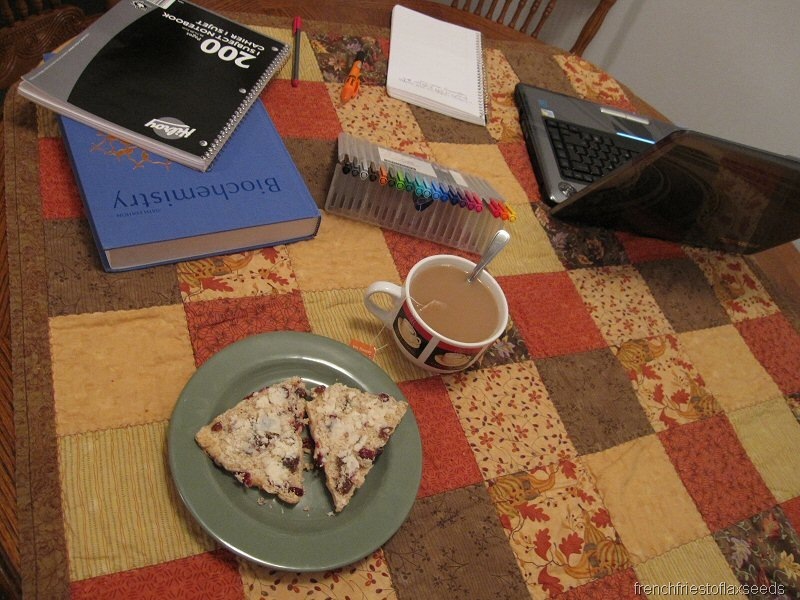 I don’t know what I’m more envious of: that killer scone or those awesome multi-colored pens. I love me some office supplies! I’m kind of proud of those multicoloured pens. Any colour you need, I got em. Great for studying, when you don’t want to highlight everything up. those scones look insanely good! i spied some pretty awesome colorful pens. i feel as long as i have my pack of every color sharpie in the world on my side while i’m studying, that things go way better! haha 🙂 a hockey pool looks like alot of fun! i totes need to get myself into that! hope this year is your year! haha, sports pools are not by most lucky investment! I’ve probably won once, out of many times. I’ve never heard of coconut butter, I should look for some of that!! It sounds wonderful. i stayed in to study too on Saturday. in fact I didn’t go out AT ALL this weekend. Oh well, my liver is happy, my hw load is lessened, I didn’t fall behind on sleep, AND I saved money! not bad! Glad to know I am not the only one who had a lame Saturday night 🙂 I have spent many Saturday’s the same was as you … fortunately last night I wasn’t studying … but I didn’t do anything exciting either. Look at all your colourful pens!!! 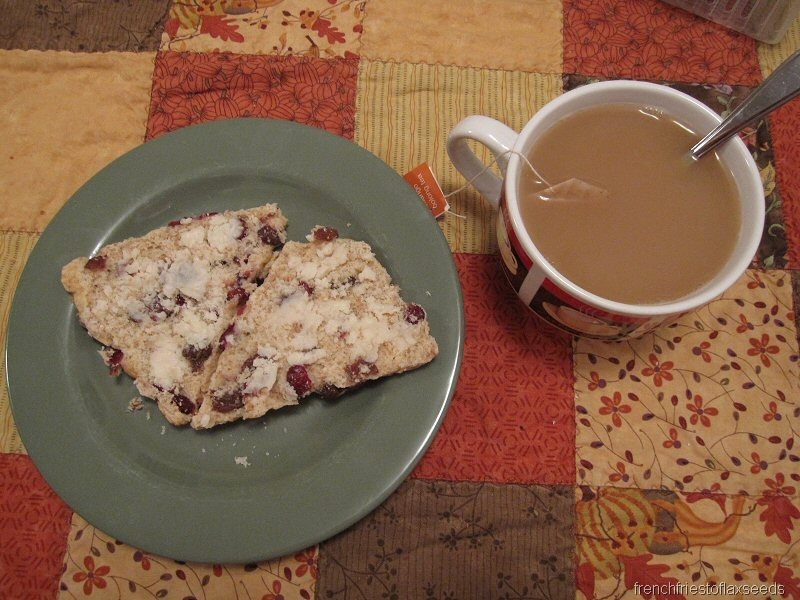 The scones look wonderfully flakey….perfect with a tea! I have to admit…I’m jealous of your amazingly cool pen holder! Seems like my set of coloured pens was quite the popular blog feature! HA!